The term “headphone amp” can sound really confusing for non-audiophiles, given that regular amplifiers are commonly used only with guitars or other electric instruments. However, it makes sense that, if you spend more than $100 on a pair of hi-fi headphones, you’d want to squeeze out every ounce of performance from them. As it turns out, portable amplifiers are really crafty devices which, when paired with high-quality headphones, can act as a standalone sound card and boost the performance of the cans. As their name suggests, these devices are used to amplify the analog signal that goes from the music player to your headphones, so that you can listen to your music and games with increased quality. However, this is only one of many functions that amplifiers can perform, as amplifiers also allow you to increase the volume past the limit of what standalone headphones could, due to their increased signal output. Furthermore, external amplifiers can provide more power than those installed into most headphones, which means that they can be used to drive the more power-hungry headphones, such as the Audio-Technica ATH-ANC7b which can drive with up to 300 ohms of impedance. Now, keep in mind that all headphones require an amplifier to power them, no exceptions. To this end, each and every pair of headphones available on the market come equipped with their own onboard amplifier. Unfortunately, in most cases, said internal amplifiers are only designed to provide the absolute minimum so that the headphones can function adequately. That being said, by purchasing an external amplifier - portable or otherwise - you are effectively supplying your headphones with more power so that they can perform like they were designed to in the first place. With mid to high range studio headphones, this amplifier really shines. Definitely worth the higher price tag. Let’s kick off this list with one of the best headphone amps we’ve ever gotten our hands on. The HA-2 is definitely among the priciest models on this list, and it provides similarly high quality to its users. It’s amazing the difference this amp can make when listening to music or watching a movie with mid to high-range headphones; the increase in sound quality is more than evident. This portable amplifier is equipped with an ESS Sabre32 Reference ES9018-K2M DAC chip, which is compatible with most systems, from Windows and Mac to Android and iOS phones. Furthermore, this amp comes with two pairing settings right out of the box to increase compatibility with most headphones. And, as if that wasn’t enough, it can also act as a power bank for your phone, for those that like to listen to their music on the go. As far as aesthetics are concerned, the OPPO HA-2 exudes luxury, as it comes with a polished metallic finish and a strip of leather enveloping most of its body. 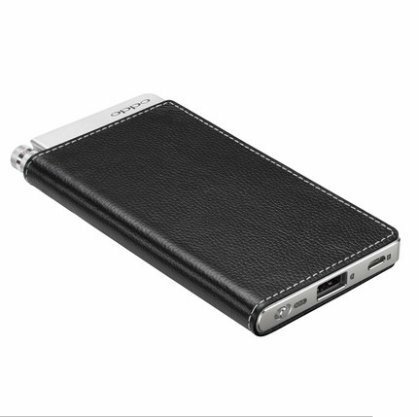 Besides enhancing the device’s looks, the leather also helps the amplifier to remain safe while you keep it inside your pockets and, in true leather fashion, it will only get better with time. It goes without saying that this product was built for those who demand not only the best performance from their power amplifiers but for those who also like to look good when walking around town, listening to their favorite tunes. When it comes to performance, we tested this amp with two pairs of headphones, the low-end yet remarkable Monoprice 108323, and the high-end Audio-Technica ATH-M50x. While we didn’t manage to perceive a significant difference with the Audio-Technicas, other than making them sound louder, with less distortion at higher volumes, we definitely noticed an increase in quality with the Monoprice cans. With the use of this amp, the mids and highs are crisp and clear, even at high volumes, with no hint of distortion, which is expected from a portable amplifier in this price range. The lows, on the other hand, feel booming and punchy, but without bleeding into the mids. In other words, the bass produced by this amplifier complements the overall harmonics and don’t intrude on the music itself. Moreover, with the HA-2, we noticed that the soundstage opened up considerably, which let us perceive instruments and sounds that we usually didn’t without the of an amplifier. With this device, you can definitely feel like you’re listening to your favorite songs for the very first time, each time you play them, which is a huge plus in our books. In overall build quality, the OPPO HA-2 definitely feel bulky and not at all flimsy. It feels like it’s actually worth the price tag. The buttons have a heft to them, and the wide variety of additional features more than make up for the high cost of the device. 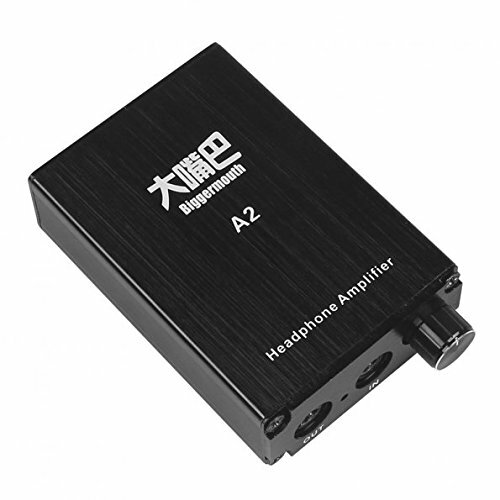 This amplifier can be used with any type of headphones and devices, and can even be used to charge iPhones, which are notorious for being incompatible with any devices other than those manufactured by Apple. That being said, this amplifier shines most when used to play high-resolution audio files. However, keep in mind that this device tends to get hot and consume more battery when reproducing these files, so don’t be alarmed if you feel your device getting hot after a few hours of use. Built for demanding audiophiles and is portable and compact. A great option for sensitive headphones. Next up is a portable headphone amplifier that, similar to the HA-2 above, manages to perform as an extremely high-quality device as well as look the part. The Audio SHIFT by Peachtree is designed for the most demanding audiophiles out there, and consists of one of the most powerful headphone amps, which is both portable and compact and is complemented with low-noise amplifiers to drive even the most sensitive headphones from over-ear, power-hungry cans, to small and efficient in-ear monitors. The hi/lo settings of the Audio SHIFT allow the amp to pair great with both high-impedance and low-impedance headphones without a hitch. Like the HA-2, this device is also equipped with an ESS Sabre32 Reference DAC, only this one is also complemented with a hyper-stream modulator, as well as a time domain jitter eliminator. As a result, the sound produced by this amplifier comes to life and can make every song feel like a live concert playing directly into your ears. The onboard 4100mAh battery is able to power this amplifier for up to 8 hours, which allows you to enjoy high-quality audio for the most part of your waking hours. 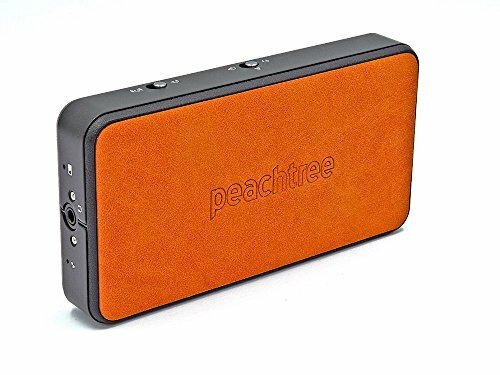 The design of this amplifier also exudes quality, and consists of a small portable device wrapped in a leather and aluminum enclosure which feels nice and sturdy to the touch, and is expected from a device in this price range. The build quality leaves nothing to be desired as well and, after testing it out with a few headphones and speakers, we discovered that the performance obtained from this amplifier is also top-notch. With the purchase of this product, you’ll receive the amplifier itself, along with a couple of cables to pair it with different devices, such as iPhone and Android phones. Furthermore, the product includes a stylish leather pouch which can be used to store both the amp, as well as your phone while you listen to the music through your headphones. However, above and beyond its awesome looks, the Peachtree SHIFT can also perform admirably, producing crystal clear highs and lows in every paired device, from low-impedance headphones to the most power-hungry cans. Additionally, this is one of the portables amplifiers which is strong enough to power high-impedance headphones, such as the Beyerdynamic DT-770, which feature an impedance of up to 250 Ohms. The only issue we found with the SHIFT is that, for a portable headphone amplifier, it’s quite big and bulky, and can be cumbersome to carry around at times. However, this issue can be easily circumvented by using a backpack to carry the amp and all its cables. Considering the high quality of audio it produces, it certainly seems like a small price to pay. 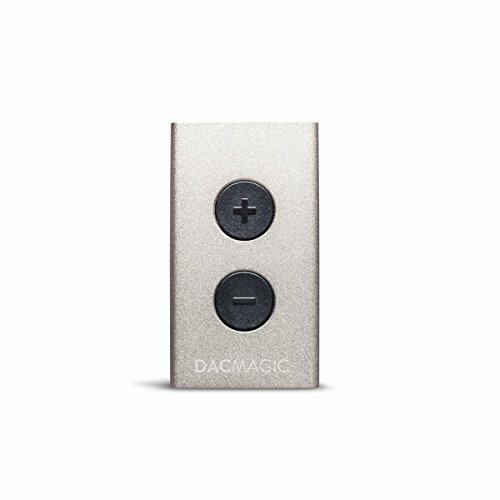 With the ability to bring quality HiFi audio to any device, the DacMagic comes from a great lineage of headphone amps. While this amplifier is certainly “portable”, it technically can’t classify as an on-the-go headphone amp, given that it doesn’t have an internal battery to power it while you’re strolling around town. This means that, while the Cambridge Audio DacMagic can definitely be used to provide high-quality, HiFi audio to any device, it must always remain connected to a power source such as a computer. However, this is where the shortcomings of this amplifier end, as literally everything else it has to offer are perks and benefits. The simplicity of the device is perfect for those that don’t want to struggle with settings and configurations, and simply want a device they can connect to their headphones to increase the quality of their music and audio. This portable amplifier is conservative in terms of design, as it consists of a small black box with two black buttons on one of its faces, which are used to control the volume of the output. The input consists of a USB port which, aside from providing power to the amplifier, is also the method by which the audio signal is transmitted to the device. The amplifier can then be paired with any audio equipment via 3.5mm jack. Like the other devices we’ve listed in this article, this device also comes equipped with an onboard DAC, which converts the digital signal from the input device into high-quality analog audio, which is amplified up to 10 times higher than the sound produced from most integrated audio chipsets. The soundstage really opens up after pairing any device with this amplifier, as you’ll discover new musical arrangements in your favorite songs, which you couldn’t normally perceive with the default amplifier included in your headphones. Great for connecting to a PC or laptop to help manage HiFi sound to your headphones or speakers. This is one of the most stylish portable amps on this list, and can be used to provide USB audio decoding capabilities which, besides than as a standard amplifier, can also be used as an external sound card for your computer. For the tech-savvy users out there, this amplifier uses the SA 9027 USB receiver, which can support up to 96 kHz/32bit and DSD decoding, which serves to provide high-quality audio conversion from digital to analog with virtually no noise. 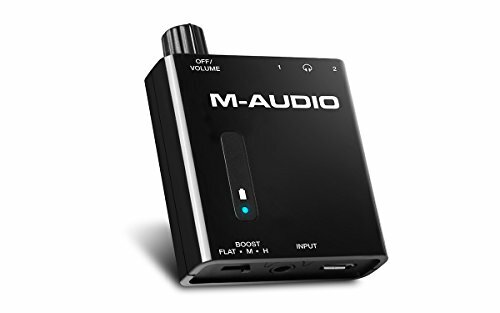 As soon as you hook this device up to your PC or laptop, the audio is immediately diverted from the speakers to the DAC, followed by the headphones or speakers connected to the amplifier. No matter what type of device you use with this amp, you will receive high-quality audio, which can be adjusted to your liking thanks to the onboard equalizer. In general, the sound produced by the E17K is clear and crisp for the highs, while the bass tends to be punchy without bleeding into the mids. Even if you decide to proceed with the default settings, the quality of your music will be increased as soon as you plug the amp into your PC. Contrary to all the devices previously mentioned on this list, the E17K Alpen allows the user to tweak their music to their likings without having to navigate cumbersome menus on the computer, laptop, cellphone, or any other device you’re pairing the amplifier with. Instead, since this amplifier has what is essentially its own built-in sound card, the audio can be equalized on the device itself. For ease of use, this amplifier comes equipped with a small LED screen which, besides making the device look really awesome and high-tech, also assists in equalization and menu navigation. And speaking of high-tech, the design of the amplifier itself looks like something straight out of a sci-fi flick. The device consists of a small black box with a brushed metal finish and the aforementioned small LED screen installed onto one of its faces. The device itself feels very compact and durable, like a product you won’t have to replace for many years, if treated with care. On the other sides of this amplifier you will be able to find the 3.5mm and 18-pin input jacks as well as the RCA 3.5mm and headphone output jacks. For added convenience, the E17K can be used while charging so, with the use of a power bank, you can effectively enjoy hours upon hours of music on the go, which is awesome for those extra long trips or flights where there are no outlets at hand to recharge the device. The HA-P50 has the ability to drive 600 ohms and is a great way to create high-quality audio performance from smartphones or digital music players. To top off this list, we decided to end it with a product from one of the most prestigious manufacturers of audio equipment in the world, TEAC. This amplifier is designed specifically to work with high-performance headphones, even with the most power-hungry models, since it can easily drive up to 600 Ohms of impedance. While it can provide high-quality audio to any device, the high-performance HA-P50 DAC equipped in this amplifier can also be used to fetch great performance from digital audio sources such as smartphones, or other types of digital music players. 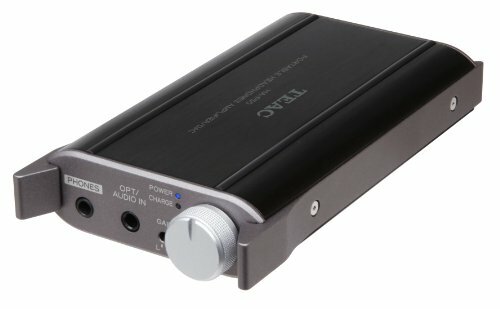 The aforementioned DAC uses a PCM5012 converter, which can process digital audio signals of up 24-bit/96kHz resolution. This amplifier also features and OPA 1652 operational amplifier, which can process music with utmost purity, and with nary a trace of distortion, even at high volumes. Due to all the features mentioned above, this amplifier can be used to really squeeze every last ounce of performance from the most high-end headphones. The HA-P50 is designed in the form of a small black box with a full aluminum body. On its sides you will be able to find the device’s many jacks, which includes Micro USB, USB, and standard 3.5mm jacks for the input, as well as the 3.5mm output jack. The device itself is small, with a body only 21.7mm thick, which feels sturdy to the touch. This amplifier is perfect for those who are always on the go and require a device that is both durable and portable enough to be carried in any pocket. The volume adjustment knob is also made completely out of aluminum and has significant heft and torque, to allow precision volume adjusting. Furthermore, the knob is complemented by two side guards to prevent accidental volume changes when the amplifier is carried in a pocket or inside a bag. As an additional quality of life feature, this amplifier has a power-saving function which makes the unit go into sleep mode after 30 minutes, if the device is not connected to any power source. Like we mentioned above, every pair of headphones comes with their own onboard amplifier in order to power their functions. In some specific models, said amplifiers are more than enough, allowing the user to enjoy the cans’ potential to the max, without having to invest in an amplifier. Furthermore, there are also types of headphones, such as noise-cancelling earbuds, which don’t need an external amplifier since they already have a decent one themselves. Other types of headphones, such as in-ear cans or earbuds don’t require an amplifier either since they are already efficient enough and require little power to perform well. That being said, the headphones which require an external amp in order to perform to their fullest are those that have the highest impedance, as their on-board amplifier will not be able to supply enough power to the drivers. While all amplifiers - portable or otherwise - are designed to perform basically the same function, they come in different shapes and sizes as well as with different specifications, all which allow them to perform different tasks with varying levels of effectiveness. That being said, there are a few elements you need to keep in mind in order to make the very best portable amplifier purchase of a product suited to your needs. The term impedance is somewhat complicated to explain in layman’s terms. However, this element plays a vital role in determining whether your headphones would benefit from an amplifier. Low impedance headphones (8-32 Ohms) can make do without a dedicated amplifier since they don’t require much impedance in order to drive their audio. High impedance headphones (32-300 Ohms), on the other hand, require a dedicated amplifier in order to unleash their full potential, given that their onboard amp will only provide the bare minimum for them to perform their functions adequately. Sensitivity is related exclusively to headphones and refers to their power efficiency at high volumes. Less efficient headphones require more power to produce sound at higher volumes, and may even distort the sound if the amplifier is not able to provide enough juice. The more efficient headphones will be able to produce audio at any volume while consuming less power for high levels. This factor is important to keep in mind as it will directly affect your choice of an amplifier; depending on the headphones you need to power, you might need to spend extra on an amplifier that can accommodate their power needs, especially if you plan on blasting the cans at high volumes. ​This element refers to the impedance output of the amplifier itself, which is roughly 1/8 of the headphone’s impedance. For example, if a pair of headphones has an impedance of 24 Ohms, then you will need an amplifier with an impedance of at least at least 3 Ohms in order to fully drive the audio to the headphones and to make use of the device’s full potential. ​The result we obtained above, corresponding to the Output Impedance, is also referred to as the damping factor. In short, the damping factor is equal to the headphone impedance divided by the output impedance of the amplifier. In the above formula, we divided the impedance of the headphones by 8, so that would be the amplifier’s damping factor. In general, the higher the damping factor of any given amplifier, the better, since the amp will have more control over the speaker it’s driving. In all honesty, this element will play a very small role when it comes to portable amps. Still, it’s good to know about this factor since some amplifiers might list it in their specifications. Desktop Amplifiers: These amps are fairly powerful, and are powered directly from a wall outlet. They are decently sized - roughly the size of a shoebox - and are used mostly as a permanent listening solution, such as for those who compose music on their computers and require the best sound quality possible, without being encumbered by an overly large device on the desk. Portable Amplifiers: Smaller sized amplifiers roughly the size of an iPod classic or a smartphone, and which are powered either via batteries or a USB connection. They can provide power to any type of headphones on the go, so you can listen to quality music at any time or place. Full-Size Amplifiers: These ones come in various sizes, depending on their purpose and power, but are usually the size of standard audio equipment. These are used mostly in professional settings or for musicians, as they can power everything from headphones and microphones to electric guitars, bass guitars, and other types of instruments. 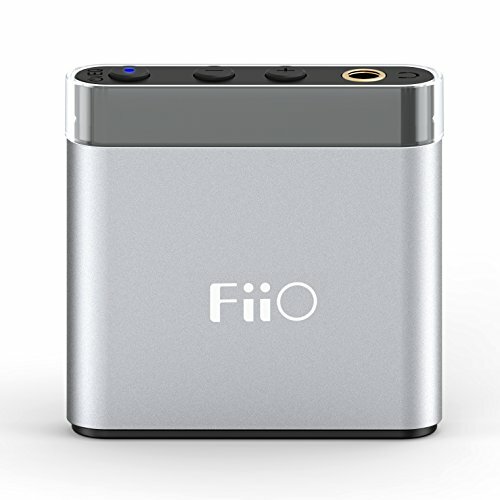 FiiO Electronics Technology, Co. is a Chinese manufacturer of audio-related products. Established in 2007, this company has taken it upon themselves to improve the reputation of the “Made In China” label. 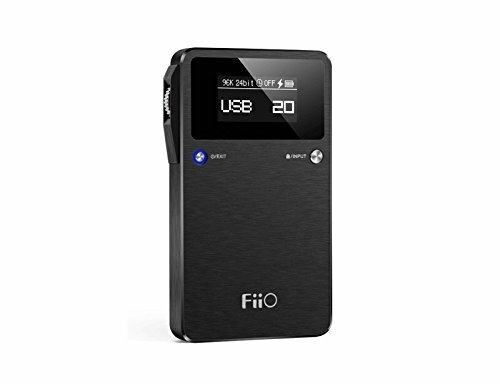 To this end, FiiO adopted the motto of “Innovation, Quality, and Service”, and promises to create products that will let their customers enjoy Hi-Fi with style. To this end, this company designs, manufactures and sells all sorts of audio equipment, from DACs and portable amplifiers to headphones and replacement parts and cables, all of which adhere to the highest ISO9001 quality standards. All of their products are designed to have the least repair and return rate as possible, to prove that not everything “Made In China” has to be expendable and low quality. TEAC America is a subsidiary company of the TEAC Corporation, a Tokyo-based company and global leader in recording and audio technology. The company was founded in 1956 with the name Tokyo Electro Acoustic Company. Over the years, they have garnered a reputation for being primarily a manufacturer of high-quality audio equipment during the 80’s. In that time, TEAC also gained renown by creating a notable amount of cassette players, CD players, phonographs, and amplifiers, which helped to set the foundation for the company they are today. Nowadays, TEAC still produces audio equipment of the highest quality for the general consumer, while maintaining a line of premium products called Esoteric for the most demanding users and professionals in the recording and music industry. OPPO is a California-based manufacturer of high-quality electronic products and audio equipment. Located in the heart of Silicon Valley, this company is popular for their DVD players and amplifiers, designed towards audio and video enthusiasts, as well as those who enjoy obtaining the most performance out of their audio equipment. This company stands out from the others, as they don’t have any marketing departments or advertising. Instead, they depend on word of mouth and on the unerring quality of their goods in order to gain attention from the general populace. In this manner, OPPO is able to dedicate their budget exclusively to the research, design, and development of their lines of products, as well as investing significantly to maintain a high-quality and responsive customer service team. With the purchase of any OPPO product, you can expect to receive the style, performance, and innovation of a company that completely dedicates their trade to producing audio electronics and equipment. Peachtree has been in the business of home audio solutions and audio electronics for 10 years now. Ever since their inception in 2007, the folks in this company have been trying to merge old-school audio with the new-age digital and computer technologies that are the cornerstone of music production nowadays. The result of this foray into unknown grounds has led Peachtree to create several award-winning DACs, speakers, and amplifiers. Their flagship line of amplifiers, called Nova, is comprised of products that can easily push any type of headphones and speakers to their fullest, without any discernible loss in quality. As a manufacturer of audio products, Creative seldom needs an introduction. This company has been around basically since digital audio became a thing. Starting off as a computer repair shop in Singapore in the early 80’s, the company had their first big break when Sim Wing Hoo - the company’s founder and current CEO - developed a memory stick to expand the capacity of the Apple II. Since then, Creative started developing products to improve upon computer technology of the time, with a focus on the audio aspect. Their early designs included technology adapted to the Chinese language, which allowed computers to recite phrases and generate speech. In the late 80’s Sim developed the Sound Blaster, a sound card which had the capacity to reproduce digital audio as well as convert analog audio signals into their digital counterparts. For the next couple of decades, the Sound Blaster brand would go on to become the de-facto digital audio processing unit present in most integrated chipsets at the time, due to being the only one which offered all the perks expected from an integrated sound card: digital audio, musical synthesizer, a MIDI interface, and a joystick port. 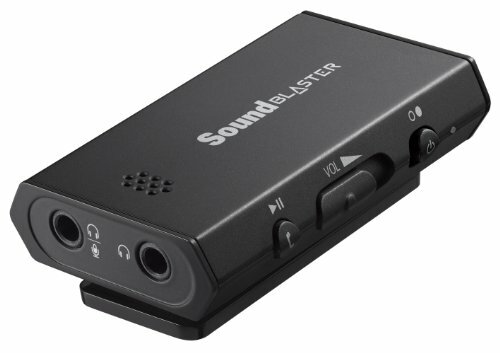 Today, Creative - and specifically the Sound Blaster brand - is comprised of all sorts of audio-related products and electronics, including dedicated sound cards, amplifiers, headphones, speakers, and much more. When it comes to casual music listening, amplifiers are one of the most overlooked devices for increasing the quality of your favorites tracks, given that most users frequently opt to invest in better headphones. While purchasing a pair of high-quality headphones should certainly be a priority if you’re looking to obtain better sound, we feel that most users underestimate the potential that portable amplifiers have to enhance the performance of most low to mid-range headphones. The truth is, despite being equipped with onboard amplifiers, these devices are often not enough to squeeze the most performance out of your headphones. For this reason, investing in a good amplifier is always a smart choice, especially if you already own decent headphones and simply wish to enjoy better quality audio without having to replace your pair of cans. However, purchasing a good portable headphone amplifier can be a tricky endeavor, especially if you’re new to the market and don’t quite know what to look for. If this is the case, we recommend using the information contained in this article, so that you are able to make the very best purchase, suited to your needs.